What’s that? Why yes, it’s another article! Open-access, peer-reviewed article, this time written more for the content creator (as opposed to the developer). Check it out issue no. 7 of Weave: Journal of Library User Experience. This article is intended to provide guidance on making library websites and other digital content accessible within the constraints of most organizations’ technological environments. Accessibility can mean different things depending on the context, but the focus in this article is on web accessibility, which the World Wide Web Consortium (W3C) defines as “enabling people with disabilities to participate equally on the Web” (W3C, 2016). Many existing articles provide an overview of the big picture aspects of accessibility, including benefits to the organization, legislation, statistics , and general principles. The focus of this piece is on specific best practices and guidelines, as well as their benefits for content creators, who frequently have limited access to edit digital content and cannot always apply recommended solutions that assume full control and access. So glad this article is now published. Works for wikimedia. Are moving towards service model vs. speghetti code model. Also run internship and do mentorship. Recently went to learn Decided to stop being a manager and be a coder and technical writer. Steve Krug: You’re NOT Doing Usability Testing? Are You Nuts? The University of Toronto iSchool was lucky enough to get Steve Krug of Don’t Make Me Think fame. If you haven’t read it and you’re at all interested in usability, I would definitely recommend it. Anyway, here are my notes from today’s talk. Convince you that usability testing is the most valuable thing you can do to ensure that what you’re building works. Realized seeing the same story over and over again. He first started by turning it into a comic. Basically the same debates happened over and over, frequently without decisions being made. It’s difficult to find a middle ground, because each person comes with their own perspective. Partly, there’s no hard and fast answer, because it depends on the context. Usability testing eliminated most debates. Seeing users use what they designed changed their perspective and start talking from the user perspective rather than personal biases. Traditionally, usability is done in a lab with the minimum 8 users in a day by an outsider, ending in an expensive report which may not be convincing to the team. Rocket Surgery Made Easy written more for people intending to actually do usability testing. Use script, which can be downloaded from Krug’s website. Instead of a website, he did a live demo on the Clear mobile app. Interestingly, the participant could not complete the task, which was interesting since the app is highly praised. A morning a month is all we ask. Start earlier than you think makes sense. – Can start before you start by testing a competitor’s or old version, or even a sketch on a napkin. Recruit loosely and grade on a curve. – Take just about anyone, and judge whether everyone would have that problem or if it’s just because not from target audience. Make it a spectator sport. Focus ruthlessly on the few, most serious problems. – Right away write down the top 3 problems to take into debrief. When fixing problems, always do the least you can do. – The smallest change might do to solve or help mitigate the problem. Tweak, don’t redesign. James Chudley CX Partners wrote on the approach to doing mobile app testing that needs context. Author CynthiaPosted on November 27, 2012 November 27, 2012 Categories Events, Web designTags usability, user experience1 Comment on Steve Krug: You’re NOT Doing Usability Testing? Are You Nuts? Gave access to ILS with small computer. Encapsulated technology in a car with public computers, books, check in/out, etc. Another Example: University of Alberta has an embedded Edmonton Public Library branch. Can get 3-4 different interfaces just doing a simple look up and placing a hold on book. Users find it too difficult to find things and so much time is spent trying to train users to use them all, but it’s a losing battle. Had no mobile interface either. First was mobile version (iOS App) and full-scale web (responsive design). Integrating Services (e-Reserve, room booking) and Resources (Physical, electronic, etc.). Also has EDS. My Account: Authentication to App using LDAP, which send tokens to everything in the App to simulate single sign-on. Search: uses EDS API, which allows limiters. Can then share through mail, print, copy, dropbox, etc. Holdings details from ILS. Consolidated 3 separate spaces of library info, search, and account. Mobile App is a pilot for the CMS. App infrastructure will serve as basis for CMS. CMS and App will share user preference and content. More notes on Access 2012 Live Blog. 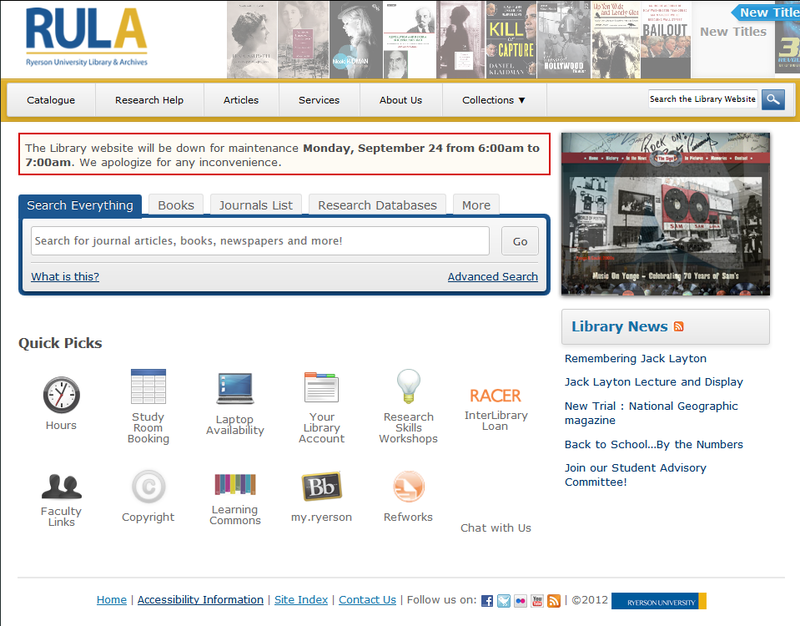 We’ve recently had to put up a couple of announcements due to some patches and upgrades on our library website server. Right now, I’m doing it the way I’ve seen it done on most library websites and that’s to simply put up an announcement on the front page. However, there are numerous downsides to this method. First, the way I’ve done it, it only shows on the home page, and no other page. Second, you have to visit the website beforehand while the announcement is up in order to know that the site will be down later. One way to get around the second problem at least, is to use the blog. Posting on the blog automatically pushes the downtime announcements to the homepage feed, meaning that anything following the feed will see the notice even without visiting the site. 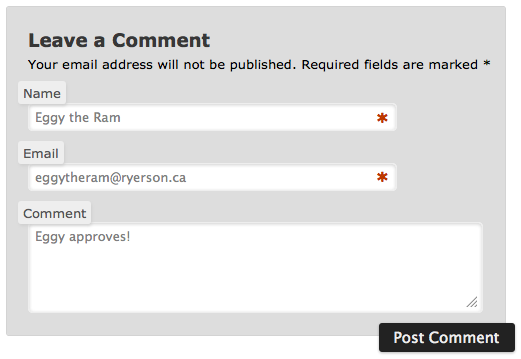 On our blog, we can also automatically push to Twitter and Facebook if we choose to do so. On the other hand, it’s very much time sensitive, and if the person doesn’t visit the site during the early hours of the morning, they wouldn’t even notice. Is it something people really need to be notified off-site? If someone visits often enough, they’ll see it. Of course, best practices seem to be to only use notification bars for browser related issues. What might work better is to have a in-page popup on first visit (once the announcement is set), with the option to dismiss it. Using cookies, you could then locally store a simple variable to see whether the person has dismissed that particular announcement already. Ideally, we could do it in such a way that it will work across the entire domain rather than just the one site. While moving our website into WordPress, I came across a blog post about adding some personality into a website (I’ve unfortunately lost the link to it). So, I thought I’d find some small ways to do that with our site too. I was recently reading as well about how successful GVSU Library has been with their construction updates using a twitter account by giving the building a persona. Unfortunately, I got various complaints that the 404 page was confusing and didn’t make any sense (from staff, it was changed before the site went public). I knew from the beginning that it wouldn’t fly with making it public for our users because they wouldn’t get it, but I thought at least one staff member would get the joke. I may have another stab at it with a simpler one, perhaps with just a headline, but that won’t be in at least a couple of months. One of my thoughts for the blog was to have a custom default avatar that would be a picture of our university mascot or just a version of our library’s logo. Unfortunately, I couldn’t find a plugin that worked on multisite that would allow me to set a custom avatar only for the main site (and not all the subsites). I actually mentioned this in a previous post that I decided to have a little fun with placeholder text, but here it is again. Eggy the Ram is the name of our university mascot. No one has actually noticed this since our blog hasn’t been moved. Thankfully, unlike the 404, the placeholder text here should have no chance of confusing people. Another idea I recently thought of that might be fun is for students to get badges during orientation or even throughout their time in school for completing workshops or similar things. Instead of an in-house system, it could be done using something like Open Badges. I’d be interested to see if other more formal institutions have done any of these or other things to add some ‘personality’ to their sites.